Sure, I like to buy souvenirs when I travel but my favorite souvenirs have always been the photos I take. So when I saw the words, “photographic souvenirs,” I was immediately drawn to this piece of trade literature. 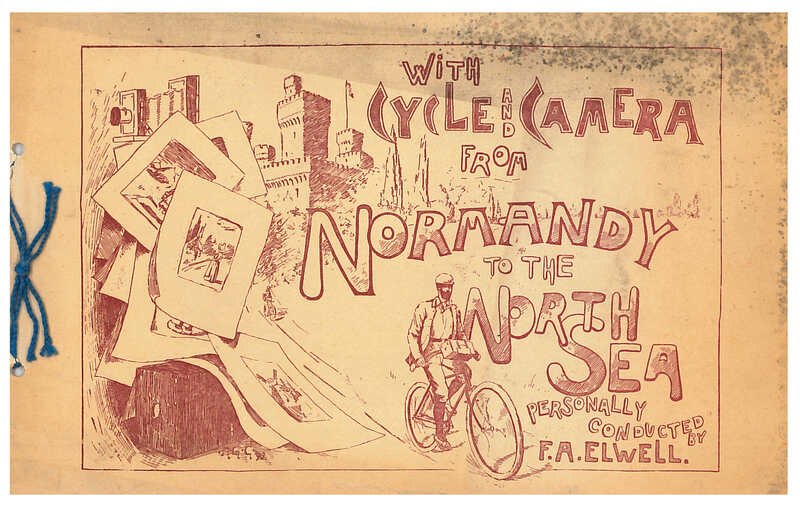 The title of the trade catalog is With Cycle and Camera from Normandy to the North Sea and it advertises a European Tour for Amateur Photographers on bicycle during the months of June, July, and August 1894. F. A. Elwell, Portland, ME. With Cycle and Camera from Normandy to the North Sea, 1894, front cover, man bicycling next to a castle, cameras, and photographs. The tour was “personally conducted by F. A. Elwell” and they bicycled through France, Switzerland, Germany, and Holland. Departing from New York and arriving in France during the first week of June, they began the bicycle part of the tour in the city of Beauvais. They traveled through Paris and continued on for three hundred miles before crossing the Jura Mountains and entering Switzerland. Next stop was Germany which they entered via the Black Forest, and the final country was Holland. They traveled through major cities and “many out-of-the-way places” before ending the trip at Rotterdam. The hope of F. A. Elwell was to “secure a party of twenty from among the various camera clubs of the country to participate in what…will be a most delightful outing.” He even offered prizes for the “best collection of fifty pictures” taken during the trip from start to finish. With Cycle and Camera from Normandy to the North Sea by F. A. Elwell is located in the Trade Literature Collection at the National Museum of American History Library.